I decided in August that we were going to have a Halloween party this year. Because I was still on summer vacation at that point, it seemed like a great idea, and there was no doubt in my mind that I could pull it off. Knowing myself, however, there was also no doubt in my mind that if I didn’t announce it right away, I would back out and not have a party because the end of October is such a crazy time at school, and it’s so much work to host a successful par ty. I created the event on Facebook right away so that I couldn’t change my mind later. True to form, when the week of Halloween arrived, I still really hadn’t done any menu planing. I had decorated the house, though, so at least that part was done (Jackson’s favorite decoration was this giant spider balloon, which is still floating around the living room). And I did have a vague idea of what I wanted to make. I was going to keep it pretty simple, mostly finger foods, and buy some gluten free cupcakes from a local bakery. And booze. Of course. The menu I finally settled on was deviled eggs (more on those later), pumpkin chili with ground beef, chicken wings (I ordered 12 lbs, and they ALL got eaten! ), Mike’s famous cheese dip and chips (not Paleo), and a veggie platter with homemade Paleo ranch dressing. This chili recipe is one I’ve made before, but in the past I’ve used ground turkey. I was uncertain that ground beef would work, but it was a huge hit with the guests and with Jackson. He’s been eating the leftovers non-stop! For the wings, I used Nom Nom Paleo’s recipe for her Magic Wings (including her Magic Mushroom Powder), and they turned out absolutely incredible. As I mentioned earlier, I had ordered 12 lbs of wings, and when I opened up the package, I discovered that the wings looked like this. 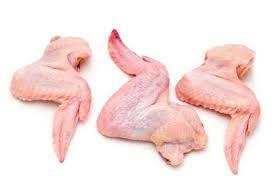 I was a little alarmed, but I quickly searched out a youtube video on how to butcher chicken wings and got to work. For the Paleo ranch dip, I used another Nom Nom Paleo recipe for mayonnaise (this technique is pretty universal). Then I whisked in coconut milk until the consistency was what I wanted, added about 2 tsp each of garlic powder and onion powder, and about 1 tsp of dill, and voila! Ranch dressing! And finally, the deviled eggs… This was the dish I actually spent the most time on. It all started out simply enough. I boiled and peeled the eggs, cu t them in half, and tossed the yolks in a bowl. For every 6 eggs, I used 4 of the yolks and added 1 avocado for the filling. I added salt, pepper, lime juice, and some garlic power, and then piped the resulting concoction back into the eggs (I used a ziploc bag with the corner cut off to do the piping). The finishing touch was what took all the time; I cut up olives to look like spiders and put them on top of every. single. egg. This took a pretty long time, but it was totally worth it. They looked awesome and were really tasty too. The party was a huge success. It was great to see some friends that I haven’t seen in a long time, the kiddos had a blast running all over the place, and the food was amazing. 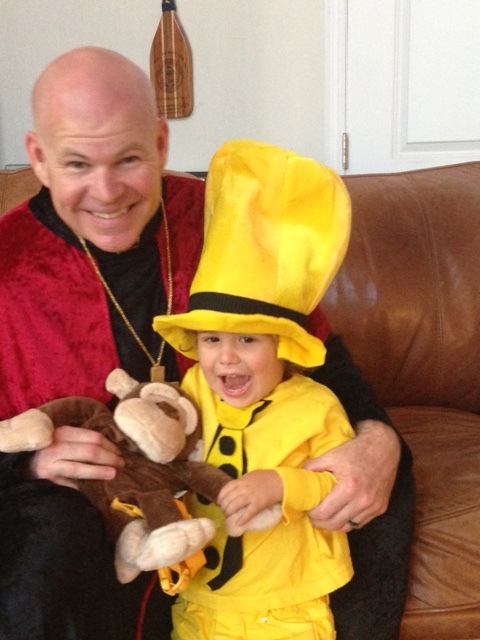 And here’s a gratuitous picture of Jackson and Mike in their costumes. I know, I know… It’s hard to believe. I’m typically not a huge fan of “paleo” versions of “standard” foods like waffles and pancakes, but somehow I got it into my head a few weeks ago that it would be fun to have waffles for breakfast on Sunday morning. 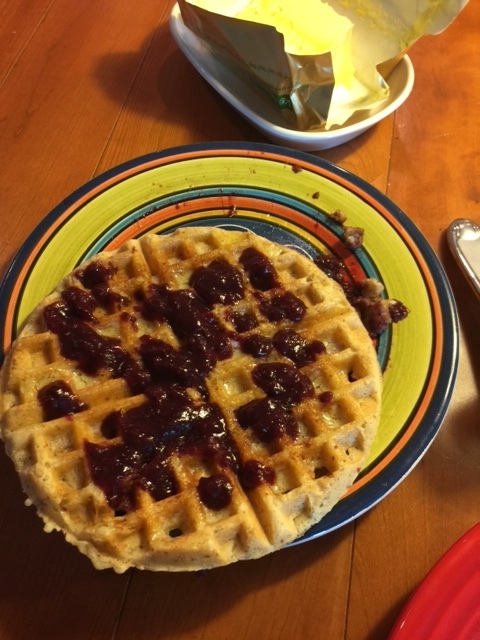 I remembered hearing about a waffle recipe on one of the podcasts I listen to, so I decided to hunt it down and give it a try. 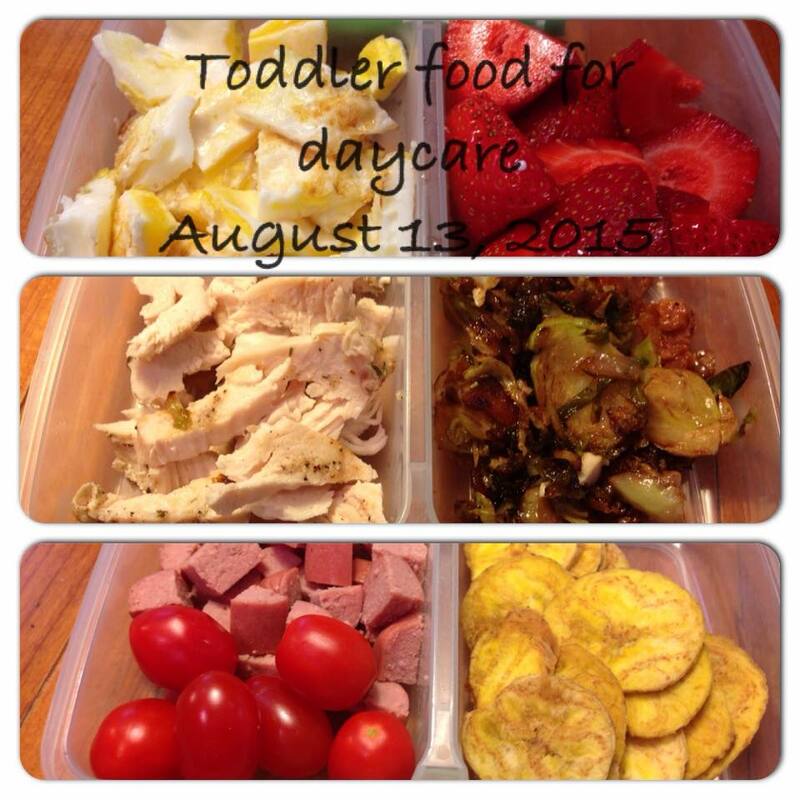 This recipe by Brittany Angell is truly amazing! (I made the second version, the Paleo Waffles.) Brittany Angell is known for being an incredible baker, but since I really don’t bake, ever, I haven’t ever checked out any of her recipes before. But based on the success I’ve had with these waffles, I will definitely look to her recipes again if I ever do decide to bake something. This past Sunday, I also made syrup from fresh blueberries and peaches. A few weeks ago, I had too much fruit in the fridge, and it was in danger of going bad, so I just chopped up the peaches and threw them and the blueberries into the freezer. To make the syrup, I put about 2-3 cups of frozen fruit into a small sauce pan with 1/2 cup of water and heated it slowly over low heat. Once the fruit was thawed, I mashed it up a bit and then blitzed it with an immersion blender so we wouldn’t have lumpy syrup. And then I just let it reduce until it reached the right consistency. I did add about a teaspoon of maple sugar, but when I make this again, I’ll probably skip that step as the fruit was plenty sweet on its own. And so a new tradition is born: Waffle Sunday! Well, it’s that time of year again, when I feel like it’s only been summer vacation for about 5 minutes, but somehow, it’s time to go back to school again. Now don’t get me wrong, I really love teaching. A lot. But I also REALLY love being on vacation. More than anything. But it’s ok… Once school actually starts, it’ll take about 3 days before I forget that summer vacation was even a thing, and I’ll be totally immersed in the excitement of the school year. He gets three meals, Breakfast, Lunch, and Snack, every day, and I also pack a thermos with milk and a bottle of water for him. These are pretty standard days of food for him. Breakfast is always a couple of fried eggs and some fruit. I fry the eggs in ghee the night before, and even though he has to eat them cold the next morning, he still seems to enjoy them. Lunch is almost always leftovers from the night before. On the left, it’s pan seared salmon with roasted veggies, and on the right, it’s roasted chicken breast with shredded brussels sprouts sautéed with bacon and a balsamic glaze. For snack, he usually either gets prosciutto (I buy it at Costco: the only ingredients are pork and salt) or organic grass-fed hot dogs from Applegate Farms. I buy those at Trader Joe’s, and they are very delicious. The pickles are also from TJ’s; there are no weird additives or unnatural colors added. The plantain chips are Inka Chips that I get from Thrive Market. (Thrive Market is a fantastic new resource that has wholesale pricing on lots of paleo friendly pantry items. I can’t recommend them highly enough. If you sign up through the link above, I get a bonus for referring a friend, and once you’re a member, you can refer friends too!). As we get into the school year, I’ll try to post periodic updates about his meals, especially if I come up with something super interesting. In the meantime, enjoy these last few days of summer vacation! Brisket is one of the cheapest cuts of beef you can buy, and this preparation method turned it into one of the most delicious meals I’ve made in a long time. This was actually the second time I’ve made this meal, but I wanted to make sure it wasn’t a fluke before I posted it. If anything, it turned out even better this time. Preheat the oven to 350. Combine all the dry spices to make a dry rub, and rub all over entire surface of the raw brisket. It will look something like this. Roast brisket, uncovered, for 1 hour. After 1 hour, remove from oven and add enough beef stock to the pan until it comes about half way up the roast. Cover tightly with aluminum foil, reduce oven temp to 300, and put the brisket back in the oven for about 3 more hours. When it comes out, it will look like this (photo to left) and be unbelievably tender and delicious. 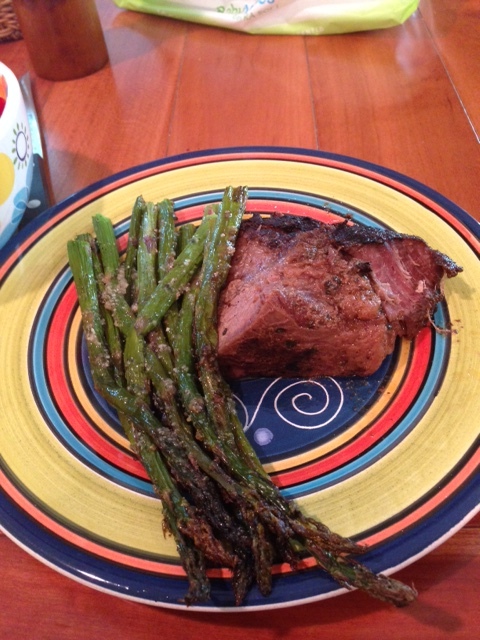 I let it sit as long as it took to roast some asparagus before slicing it, and it was an amazing (and easy to prepare) meal. During my monthly excursion to Costco last week, I saw some beautiful shrimp that I just couldn’t resist. I wasn’t quite sure what I was going to use them for, but I figured that worst case scenario, I’d just sauté them quickly with some garlic salt and eat them with a salad. Heat 2-3 tbs of the sesame oil over medium heat in a large skillet (I ended up needing a bit more cooking fat about half-way through the process, so keep your bottle nearby). Once the pan is hot, add the asparagus. After about 4 or 5 minutes, add the diced onion and garlic to the pan. Once the onion starts to soften (3-5 minutes), add the bell pepper. As the bell pepper cooks, add in your freshly grated ginger and mix well. If you don’t have fresh ginger, you can sub 1tsp of dried ground ginger. At this point, I added some salt & pepper to the mix. I tend to season periodically during the cooking process rather than just all at once. After about 3 more minutes, add the cauliflower to the pan and mix well. 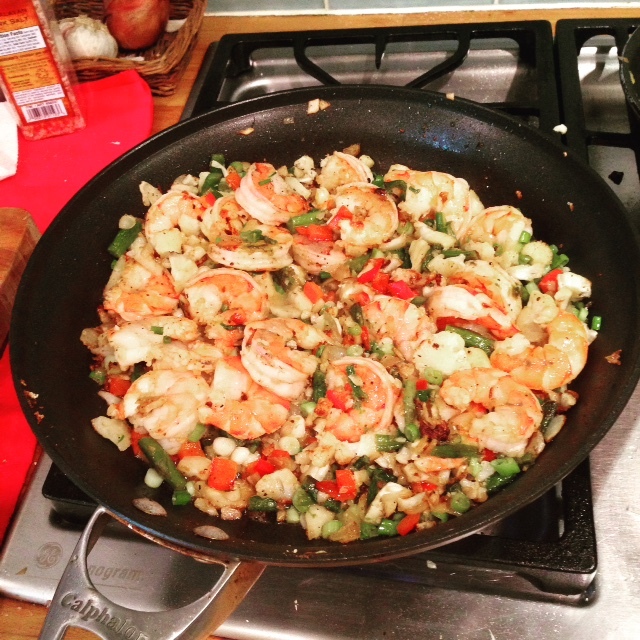 Once all the veggies are close to being done, toss in the shrimp and stir while they cook. Once the shrimp are pink all the way through, the dish is done. Add some more salt & pepper if desired, toss in the green onions for a fresh note, and enjoy! During the school year, when my time is really at a premium, the only way that I ensure that we eat a decent meal every night is to spend some time meal planning and prepping food on the weekend. This is a task that may seem difficult or too time-consuming, but spending a few hours on Sunday afternoon is a small price to pay for having a healthy dinner on the table in 30 minutes or less every night of the week. While I don’t have a specific formula I follow every week, I always start out by looking in the fridge to see what veggies I have left from the week before; I know I definitely need to use those. Because we buy our meat in bulk from The Ventura Meat Company, my freezer is always stocked with our favorite cuts of beef, chicken, and pork. At some point before doing the grocery shopping, I will typically sit down with a bunch of cookbooks to get some inspiration for the week’s meals. And even though I don’t always follow recipes exactly, I definitely like to look at pictures of tasty food to give me good ideas. Most importantly, I always make a list before I go to the grocery store. Not only does this ensure that I don’t forget anything I need, but it also helps keep me from buying a lot of random things that we don’t need and might not use. Typically, on Sunday I’ll make a big dinner that will give us leftovers for at least one more dinner that week. That might mean roasting 2 chickens or just grilling up a couple of tri-tips. Either way, I plan for leftovers. 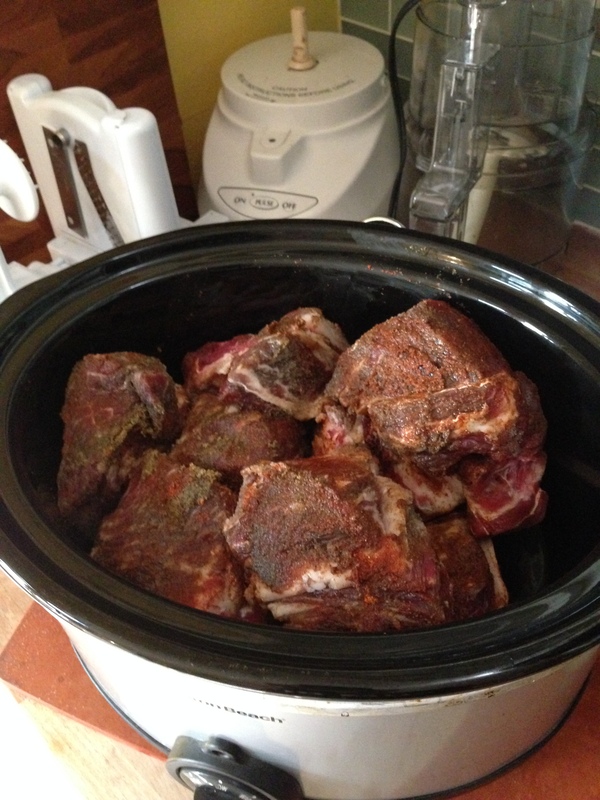 Also, I make at least one crock-pot or pressure cooker meal each week, and it’s usually pulled pork (see photo–pork shoulder in the crock-pot, ready to go). The versatility of pulled pork is really what keeps it in such frequent rotation in my kitchen. I can sauté some veggies and make some Paleo tortillas and we have some delicious fajitas, or I can season it with cinnamon and roast some apples and take the dish in a totally different direction. I can make a lot at a time and have leftovers for lunches (and breakfasts) for most of the week. At least one weeknight meal is a quick stir fry that takes less than 30 minutes to get on the table (if I have time the night before, I might even pre-chop the veggies). And we usually have some version of bacon and eggs for dinner once a week. I typically don’t cook on Friday nights, but we often have enough random leftovers so that everyone gets fed. And if we don’t, I’m ok with getting some take out or going out for a quick bite on Friday evenings. Even if explicitly planning out every weeknight meal isn’t realistic for you, I strongly recommend that you plan at least 2 meals a week and try to do a bit of batch cooking on Sundays. It really pays off in the long run. Check out this post and this post on my old blog where I detail an actual plan from a real week. A Summer Vacation Miracle: I Baked!!! I know. I almost don’t believe it either. 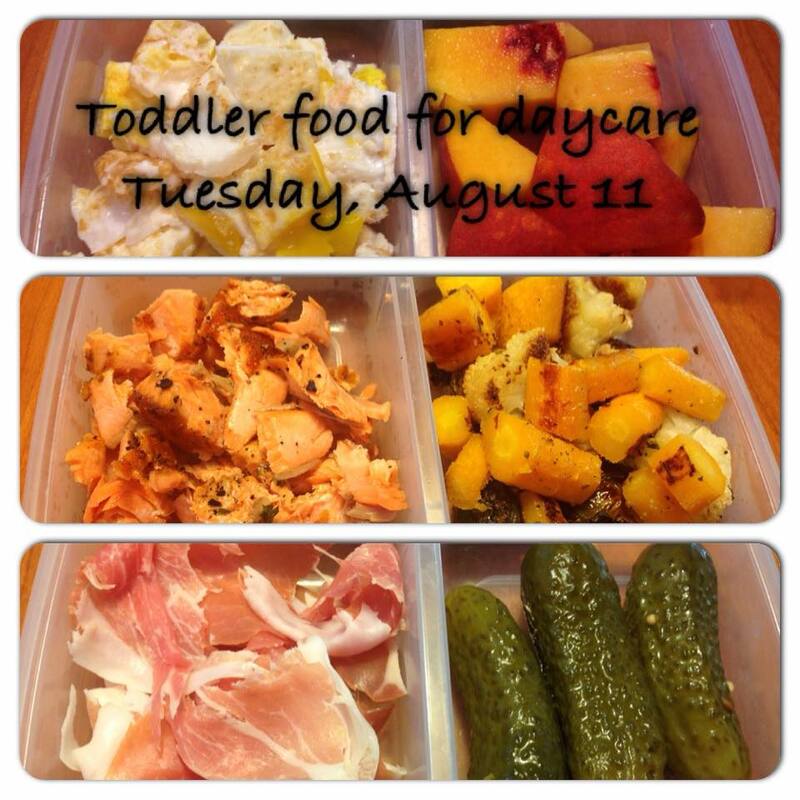 In anticipation of going to a playdate where I knew there would probably be a lot of sugary treats that I wouldn’t want Jackson eating, I was wracking my brain about what I could take to share with everyone that was a little more interesting than a bowl of fruit. 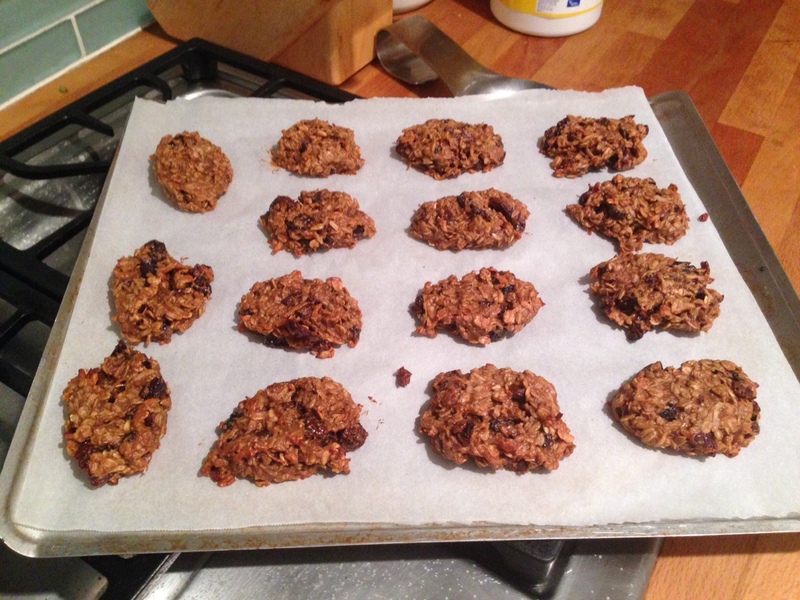 And then I remembered these oatmeal banana cookies that I had made once or twice before but hadn’t revisited in quite some time. The reasons I love this recipe so much are that 1. I don’t really have to measure things too carefully, and 2. it contains no ingredients that I am in any way uncomfortable with. Preheat your oven to 350. Moosh all the ingredients together in a big bowl (“moosh” is a highly technical term). Make sure everything is mixed together thoroughly. Spoon onto a cookie sheet lined with parchment paper. I ended up with 15 cookies, but mine are definitely on the bigger side. Bake for 15-17 minutes. And you’re done.